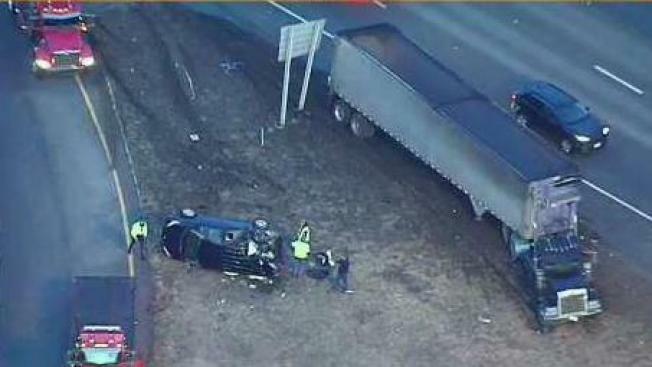 Rollover Crash Involving Big Rig in Burlington, Mass. Authorities are responding to a rollover crash involving a semi-truck Thursday morning in Burlington, Massachusetts. The crash was reported on Route 128 northbound at Route 3A. Although it is unclear how many injuries occurred, aerial footage from NBC10 Boston's Sky Ranger helicopter captured paramedics taking a stretcher out of an emergency vehicle. Details on what led up to the crash were not immediately clear. The cause of the crash is under investigation.